For most musicians, this is the nightmare. It’s clearly not a place ​you want to get to ​but most musicians tend to think there’s only one way to avoid it: don’t make any mistakes in the first place. In order to avoid this scenario, you play it safe. But it’s not really a great solution. It’s effective, but only up to a point – some mistakes will still creep through. Possibly more importantly, playing it safe is not a whole lot of fun. There are lots of physical movements which have to be carried out to extremely high levels of accuracy. These individual movements have to be coordinated with each other at a specific point in time, and the whole sequence of movements has to be carried out with a specific rhythm. Then you need to add in the brainpower needed to recall, improvise, or read the music we’re playing, and the fact that we have to match all of this up with other musicians in real time. When you look at it in this way, it’s simply not possible for anyone to get everything right all the time. In fact, it’s almost more of a surprise that people have the ability to get things right as often as they do. No matter how much you play it safe, you can’t guarantee that you’ll successfully avoid all mistakes. So resolve to be kind to yourself and accept that you’re going to make mistakes, and that this is ok.
There’s a bigger problem here too. When you’re playing it safe, you’re deliberately operating well within your comfort zone. This means that you’re actively giving up the possibility of realising the limits of your potential. Had you ever thought about it that way before? Or were you so fixated on the mistakes you were looking to avoid that you didn’t consider what you might be giving up in return? If you think back to the nightmare scenario at the start of the article, this might look as though you’re left with a dilemma. Do you choose to play it safe but limit yourself? Or do you opt to fly high but risk crashing and burning? As you might have guessed, there’s another way out. The nightmare scenario doesn’t just come about because you made a mistake in the first place. It also depends on your attitude that mistakes are a bad thing. Change that attitude, and you can continue merrily along with your playing even when mistakes do crop up. Here’s where a lot of people come up short. It’s one thing to say and another to do – especially in a performance with real stakes. The ideas we’ve covered here make a great starting point. Simply recognise that mistakes are inevitable and ok. Remind yourself that your reward for being open to the possibility of the odd mistake is the very real effect of performing at a higher level. In case you want a bit more, though, here’s another useful titbit to remember: people judge you much less than you think they do. They’re not paying as much attention as you think and so they don’t notice a lot of mistakes in the first place. And when they do notice something, they don’t tend to judge harshly. For a quick view into how this works, think back to a performance you’ve seen where someone else made some mistakes. Now consider how much this affected your enjoyment of the performance. Is that the first thing that comes to mind when you remember the performance later? In case you’re tempted to go crazy as a result of reading this (unlikely, but you never know), just be aware that I’m not encouraging you to make huge numbers of mistakes. Or to deny that mistakes have any consequences at all. Your potential for playing at the limits of your ability will be there when you’re making occasional mistakes (and probably relatively small ones at that). And it’s still important to be able to learn from your mistakes later – it’s just that the middle of a performance is not the time for that. We’ve seen that it’s impossible to avoid mistakes completely. Then we learned that if you want to give yourself the chance to reach the highest levels of performance that you’re capable of then you’ll have to accept occasional mistakes as the trade-off. Finally, we saw that it’s not the mistakes themselves that are typically the big problem. It’s how we react to them. 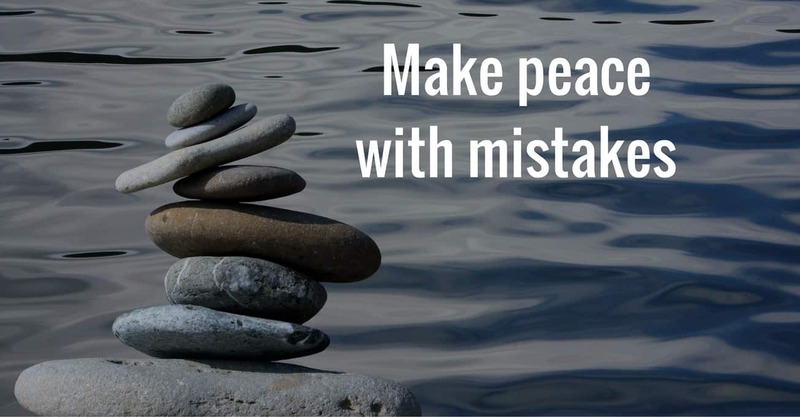 What I want you to do now is to resolve to be ok with occasional mistakes in the future. Don’t worry for now about how well you measure up to that resolution. Chances are that you’ll find you fall well short at first. Just make sure you really mean it right now. Remind yourself of it from time to time. If you hold to it over the long-term then – maybe very slowly, maybe faster than you imagine – you’ll find that wonderful changes start to happen. What’s your attitude to mistakes? Had you realised that you’re making a trade-off by trying to avoid them? Let me know in the comments section below.